Everyone likes to grab a bargain, so how about a 4K action cam that would normally cost almost $250, for just $97.26? Sounds good doesn’t it? No, it sounds amazing! 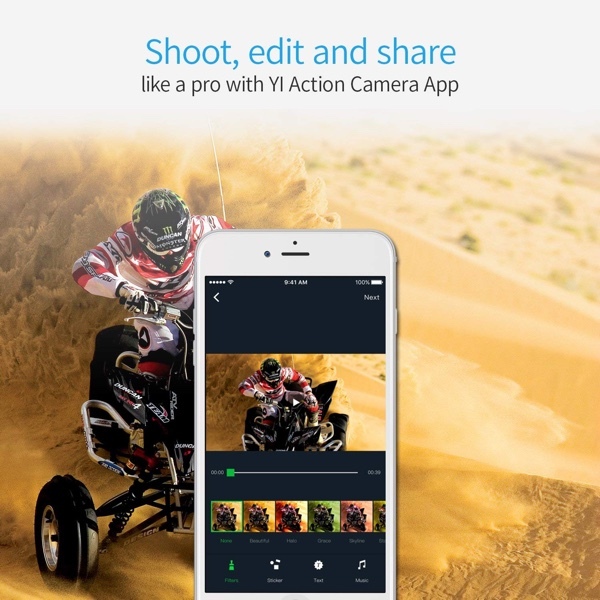 The action camera in question is the Yi 4K Action and Sports Camera, and it has plenty of top notch features to make it well worth the money, especially at this discounted price. Buyers will get a camera capable of 4K/30fps all the way down to 720p/240fps. You’ll be able to record for around two hours at 4K on one single charge, and there’s a touch-screen built in for interacting with the camera and making changes to the settings and such. Getting video off the camera is super simple, and Bluetooth and WiFi connectivity is included to offer connectivity to the free Yi Action app for both iOS and Android. If you really like to get your hands dirty, there are also settings for adjusting the ISO, white balance, shutter speed, and more or anyone who wants complete control of what the 12-megapixel camera is doing. Be sure to check out the full Amazon listing for the complete rundown on features, but we’re pretty sure that most boxes are ticked with this little camera. To get the discount, head on over to Amazon, clip the on-page coupon code and enter discount code VE44AZLH When checking out. Anyone on the lookout for an action cam that can go anywhere and record video, this is a great, inexpensive option. Didn’t realize this is a “discount look out” hot deals” website. Not what it used to be.